Picture the current New York Yankees coming out in uniform onto the field prior to a game against, say, the Boston Red Sox. Instead of running sprints or stretching, the players line up and are put through a military drill by an Army sergeant, using bats instead of rifles. Although such a scenario seems ludicrous today, it is precisely what happened in the spring of 1917 on the eve of America's entry into the war. This is just one of the many interesting episodes revealed by Jim Leeke in his new book on the state of professional baseball during the war years,in From Dugouts to the Trenches, his third book on the topic. The story is told from the point of view of team owners, league executives, sportswriters, government officials, and, of course, players. Yankees' co-owner Capt. T. L. Huston dreamed up the baseball military preparedness drill idea. Not all major league teams went along with the idea, although many American League teams joined in the scheme. The season started soon after the US declared war; the country and professional baseball were plunged into war, prepared or not. Leeke covers the immediate concerns over the draft and how this would affect baseball. Team owners and league officials seemed divided over the prospects for the 1917 season, and Leeke outlines their concerns. In fact, much of the book is a recitation of baseball's woes during the war years. Leeke covers the various disagreements between and among owners, league officials, and government functionaries. 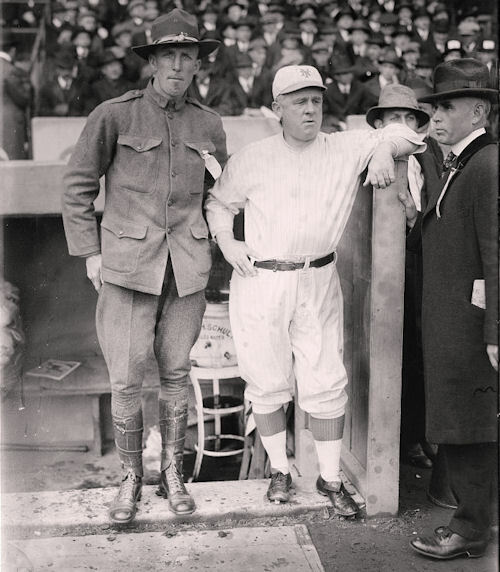 Pleasant episodes, such as the military service of ballplayers and the various charitable wartime enterprises supported by organized baseball, are also recounted, giving a full picture of baseball "at war." Of great interest is Leeke's coverage of the wartime minor leagues, of which there were five: Classes AA, A, B, C, and D. According to Leeke: "Minor league baseball was no enterprise for the fainthearted. In the best of times, the leagues were hardscrabble, chaotic, and a good way to lose your shirt—and perhaps your hat and overcoat in the bargain" (p. 21). One by one, the various teams and leagues folded throughout the year, hampered by poor attendance and a drain of serviceable talent. Some professional ballplayers left their teams in order to obtain work at various shipyards, steel mills, and ordnance plants. Men working these jobs were, of course, exempt from the draft; as an added bonus, the places of employment began to field pretty decent baseball teams with the talent obtained from the professional players. Although this was strictly legal, it opened the players up to accusations of "slackerism." Leeke also covers the men who were drafted or joined the colors voluntarily. Many of them, as would be expected, played for Army or Navy service teams. Indeed, one Navy team, the Wild Waves, played "a class of baseball that the weakened Major Leagues were hard-pressed to match" (p. 122). Many men served in combat, while others served stateside or in support units. The big blow to baseball in May 1918 was Provost Marshal General Enoch Crowder's edict that men must be engaged in some "useful" occupation or else face the draft, regardless of their draft number or exemption classification. This was dubbed the "work or fight" edict, and it was aimed at men who worked as poolroom or sales clerks, attendants, footmen, fortune tellers, elevator operators, and the like. Organized baseball waited to see whether the declaration applied to professional ballplayers. The final decision, promulgated by Secretary of War Newton Baker in July 1918, put ballplayers in the work or fight category. 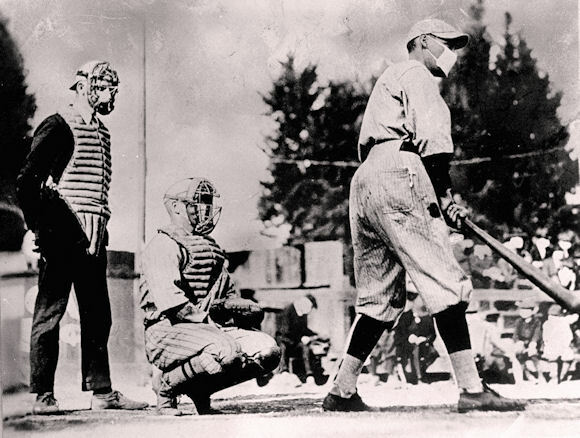 Leeke recounts the story of the resultant truncated and confused 1918 baseball season. A shortened season and rushed World Series were only some of the results of the turmoil. In briefly summing up the military careers of some of the ballplayers, Leeke reminds us that they, too, were subject to the life-changing hardships of the service. Some men, such as Christy Mathewson and Grover Cleveland Alexander, never regained their prewar skills. Indeed, Mathewson's life was probably shortened by the rigors he experienced; he was accidentally gassed in a drill and died in 1925. Leeke, a former journalist and baseball writer, has peppered the text liberally with quotations from contemporary newspapers. These effectively add to the narrative and reflect the flavor of the times. Thirty-two black-and-white photographs of the men in the narrative enhance the text, and the endnotes and bibliography are extensive and helpful. From Dugouts to the Trenches is a wonderful complement to Leeke's previous two books on baseball and World War I. It will be a fine addition to the library of baseball enthusiasts and students of the American experience in the Great War. Interesting - I wonder how many of the major league teams from 1917-18 still exist in their original cities? Maybe the Yankees and Red Sox? Let us not forget the Chicago Cubs. The Cubs won the NL pennant in the war-shortened season of 1918, where they played a part in another team's curse: the Boston Red Sox defeated Grover Cleveland Alexander's Cubs four games to two in the 1918 World Series, Boston's last Series championship until 2004. Not to mention the Chicago White Sox, Detroit Tigers, and Baltimore Orioles. All I can recall at the moment. Also still extant from 1918: Philadelphia Phillies, Pittsburgh Pirates, St. Louis Cardinals. T.L Huston co- owner of the New York Yankees was a volunteer in the 16th Regiment of Engineers (Railway) Michigan only all volunteer Regiment. He later was Commander of the Regiment. He was responsible for Babe Ruth becoming a Yankee and supervised the building of Yankee Stadium. T. L. Huston was nearly 50 years old when he volunteered in May of 1917.